You mean business. So do we. At the UIC Business Liautaud Graduate School, you can earn your master's degree at a pace that fits your life. Our program connects students to Chicago’s living classroom, and empowers them with a proven education, real-world skills and professional experiences that add up to a high-value return on investment. 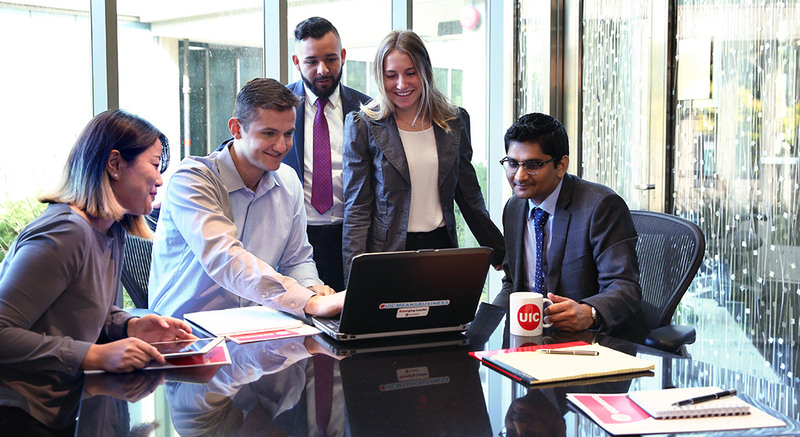 For the past 20 years, UIC Business has formed valuable partnerships with corporations across the globe to offer focused, cohorted MBA programs that meet a company’s strategic needs. CMBA programs are one-year full-time degree programs that follow specific tracks, such as Strategic and International Business Management, Financial Markets and Risk Management, or Healthcare Management. Students apply through a sponsoring organization or corporation working in partnership with UIC. For more information about these programs, click here. A benefit of studying at UIC Business is the access students have to a bustling metropolis. With many student organizations and events, as well as cultural activities and professional opportunities offered in the city of Chicago, UIC Business Liautaud Graduate School students are never without an opportunity to enhance their learning experience. UIC Business’ robust student organizations complement the academic program by offering hands-on leadership and networking opportunities with faculty members, alumni and the business community. These organizations, all initiated, developed and led by students, reflect their interest in enriching the academic, social and community involvement that is part of their UIC graduate experience.